The double side labelling machine for oval bottles is totally automated and also extremely user-friendly. This vertical and linear equipment is useful for applying labels on the front as well as back side of oval shaped bottles and containers. 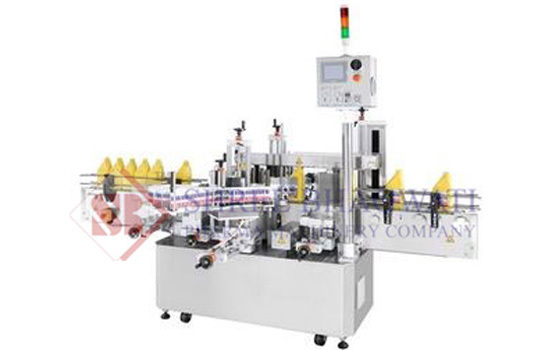 It is especially designed in order to provide a continuous motion for the pocket type bottle alignment system. This double side labeling machine can deliver an output of up to 100 labels in one minute, based on the label and product size. The labeling speed also depends on the uniform movement of the product on the machine’s conveyor at higher speeds. Further, it even incorporates an automatic system for product alignment, which is synchronized with the top holding belt system for ensuring highest stability and proper positioning of the oval shaped bottles. The double side labelling equipment also has a label dispensing system and a modern system for sensing the labels and products. This multi-purpose labeling machine fulfils the needs of numerous users of latest packaging lines. Besides, the machine has easy to use adjustments, thus it requires minimum changing of tools or components. It is also very perfect and long- lasting. Moreover the moving pocket system, and the feed worm system ensures accurate alignment of the bottles on the conveyor, to precisely label different types of bottles utilized for many OTC products and cosmetics. This simple double side labeling machine model even has an inbuilt single point synchronized speed control system. Additionally the integrated and pre-programmed label length detection system helps to eliminate manual input and storage of label length data in the memory and retrieving the same details every time the label size is changed and the machine is restarted. This double side labelling system hence reduces your cost, and saves time, avoids machine down time, and increases the production. It is also available with an optional acrylic or glass safety cabinet. Speed Up to 100 Labels per minute depending on Product and Label Size. The speed is also depending on stable movement of product on machine conveyor at higher speed.